For a short time this summer, Florida State was the rumored target of a Southeastern Conference raid on the Atlantic Coast Conference, in the protracted and sometimes absurd realignment that still is reshaping college football's landscape. Ben Haumiller, a proud Seminole alumnus, knew that change was unlikely in the real world. Florida State burned a bridge when it chose the ACC over the SEC in 1992. But on his Xbox 360, FSU was already lacing up in the nation's premier league. "I'm not gonna lie, when people were whispering that Florida State was going to the SEC, you're damn right I started an NCAA 12 dynasty with Florida State in the SEC," said Haumiller, taking advantage of a conference realignment feature incorporated in this year's game. "And oh God, here I am at Alabama, and Georgia, and at Neyland Stadium hearing 'Rocky Top.' I had a blast doing that." When he goes into work, however, the variables and fantasy scenarios are not all fun and games. Haumiller, the producer of EA Sports' NCAA Football series, is also riding the crest of a wave of change, along with athletics directors, television executives and, yes, fans, coaches and players. Whether a conference swells to 22 or even 14, as the SEC will next year, the uncertainty in eight major conference memberships has Haumiller's development team building several contingency plans, and facing a nightmare scenario in which the game released in July 2012 doesn't reflect the reality coming in August. "We're going to go as late as we can possibly go to be correct," Haumiller said, acknowledging that uncertainties in the departures of Pitt, Syracuse, and West Virginia from the Big East could be resolved after the game enters its alpha state around April or May. So could the desperate, circle-the-wagons alliance of a proposed Mountain West-Conference USA merger, creating a 22-team megaleague to protect the midweek broadcast viability of college football's have-nots. Anyone who has ever built a custom schedule in NCAA Football, especially with an independent team, knows why Haumiller is so concerned. The game's scheduling into future simulated seasons requires a deeply complicated logic, much more than simply following the currently announced schedule of a professional league and its predictable rotation of interdivisional matchups. This schedule touches multiple modes of the game also, from the standard Dynasty, to the Online Dynasty, to its Road to Glory singleplayer. There are 120 teams in the Football Bowl Subdivision ("major" college football) this year, and another three come aboard next year. Creating a realistic national schedule that doesn't send Florida Atlantic to Wyoming for no good reason is tough enough. In divining how 12 and 14-team superconferences, which can't play a full round robin among all their league's members, will protect certain annual rivalries and plot future matchups, a Ouija board is as accurate as any current information. "A 22-team conference is something we've never had to deal with before," said Haumiller. "It would break our code," as currently written, he said. The current version of NCAA Football, allows users to manipulate the memberships of all existing conferences, expanding or reducing them to 16 or 6 members, if they wish. Automatic major bowl bids and other scheduling parameters also are incorporated. It was a direct response to last year's conference realignment upheaval, which saw two Big 12 teams defect, nearly unraveling the entire league (which remains in a precarious position today). Haumiller and company had been planning for everything from unbalanced SEC divisions of eight and six teams, to Auburn shifting to the SEC East. 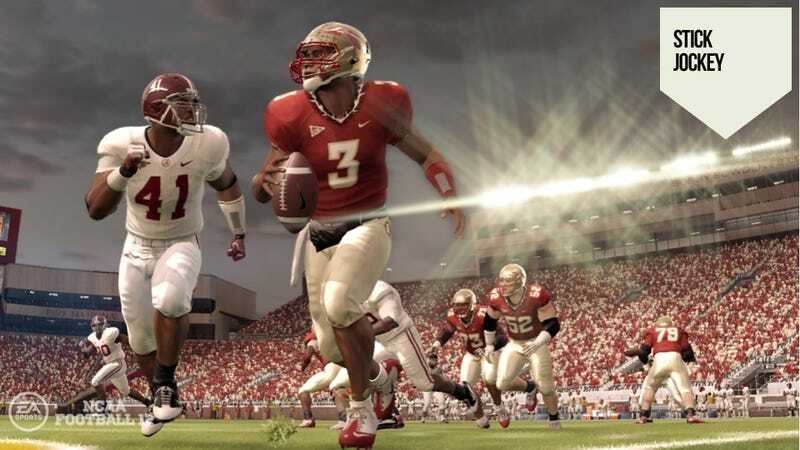 Yet even that farsighted development isn't enough to get NCAA Football 13 ahead of the news. EA Sports Tiburon still has to be ready to respond at a moment's notice to the latest oddball rumor of a school switching leagues. The SEC just announced that Missouri will be placed in its Eastern division (despite being one of four teams west of the Mississippi). Haumiller and company had been planning for everything from unbalanced divisions of eight and six teams, to Auburn shifting to the SEC East, and trying to predict what that would mean for the Tigers' schedule with rivals Alabama and LSU, and then Georgia as an every-year divisional foe affecting other games. Haumiller said his team is building code for NCAA 13 that tries to accommodate scheduling in a 22-team, user-created league—even one jampacked full of traditional rivals like Alabama, Tennessee, Ohio State, Michigan, Cal and Stanford, who stage their matchups on specific dates in the season. But this logic may not make it into the final game. They'll work as long and as far as they can until either real-world events sort themselves out, or the NCAA Football developers have to make a choice between keeping that code and maybe implementing another feature. Haumiller said he would prefer for a 22-team scheduling engine to remain in the game, because one of the game's greatest strengths is how users can rearrange conferences between seasons. In essence, if EA Sports gets to a point where it's stamping discs with conference memberships still unresolved, ideally it could still put out a game where users can correct that themselves after spending five minutes in a menu. "If it takes a little amount of work, and removing it would not leave much room for a new feature," it'll probably stay, Haumiller said. "But if it would be a large task to implement, and there's no certainty it will happen (in real life), I could see us making a decision to say, no, this other thing is what we want to get into the game. Do I want to get that in there? Yes. But the reality is we only have a limited amount of time and space." One thing the NCAA Football team will not do is implement conference changes in future years, within the game's Dynasty mode. For example, Syracuse and Pitt are technically bound by a 27-month notice that would keep them in the Big East until 2014. Few expect that to hold up; either the universities will buy or sue their way out of the requirement or the Big East will waive it. West Virginia's departure for the Big 12 is similarly clouded. The game won't assume future moves in its Dynasty mode. TCU quit the Big East before playing a down in it. Haumiller said conference makeups in the game's Dynasty mode simply can't incorporate conference membership makeups other than those in the current year of release. Had its Dynasty tried to implement changes planned for the future seasons, then in the second year of your NCAA 12 dynasty TCU would have switched to the Big East, as was planned at the time of the game's release. Yet a month ago, the Horned Frogs suddenly announced they were joining the Big 12, before playing a single down in their new conference. NCAA Football 12's deep realignment capabilities, introduced this year, are remarkable in what they allow a gamer to do to a licensing body that's usually conservative and keenly observant of traditions. The user could create a college football landscape that straight-up parodies the cynical cash-grab going on. You can reconfigure the widely despised BCS automatic berth structure and rename the divisions of existing 12-team leagues, which would seem to be a swipe at the roundly jeered "Leaders" and "Legends" divisional names of the Big Ten. Haumiller didn't know if a Big Ten representative was in the room when EA Sports presented its game, with the divisional renaming feature, to its licensing partners this year. But the project team has earned the trust of the NCAA, the conferences, and the Collegiate Licensing Company by being responsive to its requests in the past. Divisional renaming was pitched, and approved, as a means of giving users control over modifying conferences and not being stuck with generic "Division A and B" naming. If a user creates a conference with Oregon and Texas as members, NCAA Football must still preserve those teams' rivalry games on the schedule. Building that code takes a ton of work. But even with some leagues' existences in doubt—the Big East, notably, and whatever becomes of the Mountain West and Conference USA—Haumiller can't foresee ever giving users the ability to rename, delete, or change the symbology of existing conferences. Such a feature could diminish or insult a critical licensing partner. Nor would EA Sports Tiburon write code that allows the game to remake its conference alignment by itself between seasons. Allowing users to modify reality is within bounds, Haumiller said, because it's a user imposing his own personal statement upon a product he purchased. AI-driven realignments aren't going to happen, because then it appears to be EA Sports speaking for the NCAA. Major sports video games have had to react, quickly, to real-world developments all year long. A lockout in the NFL, though it ended before the season began, greatly influenced Madden NFL 12's choice of features and emphasis this year. The ongoing lockout in the NBA has pinched NBA 2K12's "NBA Today" feature and required 2K Sports to develop contingency plans to reintroduce it, as well as rookies who couldn't be used in the game because of the work stoppage. Yet even in light of the drastic consequences of a total work stoppage, it's hard to consider a development team facing more last-minute uncertainty than NCAA Football's, and its product ships in nine months. "Every time Joe Schad at ESPN reports this team is moving to this conference, this really means we've got more work to do," Haumiller said. "It's not just the part of your brain that goes, as a college football fan, hey, that's interesting. You're also thinking, alright, gotta write that down and get started on it as soon as possible." A self-proclaimed traditionalist, and a bowl-system defender, Haumiller seems to enjoy the challenge of assuring that dozens of rivalries, and their carved-in-stone meeting dates, remain intact through the millions of simulated seasons his game serves up each year. It's also a chest-puffing point of pride he and his colleagues can lord over their Madden counterparts, who work in the same office. "Yeah, I don't want to hear anybody from that side of the building bitching about their schedule changes," Haumiller laughed. "They've got 32 teams and set conferences. Get outta here. That's nothin'."